Pierre & Vacances Premium Les Hauts Bois residence offers spacious and comfortable yet cosy self catering ski apartments with a balcony, the majority offer splendid views of the resort and surrounding peaks. Only a short walk from the resort centre and Aime La Plagne's shopping centre, the residence offers direct access to the slopes on skis. These spacious and modern Aime La Plagne ski apartments are equipped with WiFi internet access. After a day's skiing, you can relax at the Deep Nature Spa by Algotherm where you can enjoy use of the indoor heated swimming pool, saunas, steam rooms, cardio-training room. Facial and body treatments are also available at a supplement. The permanent magic of a luxury residence facing Mont Blanc. A doorstep skiing departure point from which to explore the Paradiski area's 425 kilometres of slopes. An integrated "Deep Nature Spa" by Algotherm and indoor swimming pool. The mountains in winter provide the opportunity to try out a range of snowsports and activities for non-skiers. 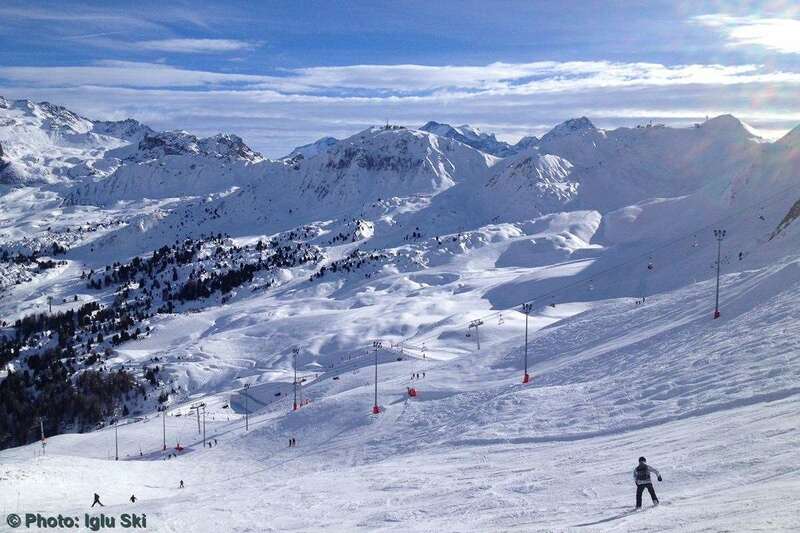 Aime-la-Plagne offers holidays that meet your needs, whether you're looking for peace and quiet or an adrenaline rush. - Ice-rink or snowshoeing for some gentle exhilaration - Hurtle down 110 kilometres of bobsleigh slopes on the 1.5 kilometre bobsleigh run. The only one of its kind in France! - The Grande Plagne ski area and its 225 kilometres of slopes - The Paradiski area and its 425 kilometres of slopes - Get away from it all at the "Deep Nature Spa" by Algotherm. The residence provides a bakery service: enjoy fresh bread and warm pastries by reserving the day before at reception. Select "Breakfast premium" for added comfort, to be booked before your holiday. When you arrive, a gourmet basket is delivered to your door, with everything you need to get the day off to the right start. Pastries and fresh bread are also delivered to your apartment every day. The home catering service can deliver dinner or regional delicacies directly to your apartment. Don't forget our new shopping home delivery service. Do your shopping online and it is delivered to your apartment on the day you arrive. Orders taken up to five days before you arrive at www.pvp.food-pack-service.fr. Opening hours of the reception: From Sunday to Friday from 8 am to 9 pm. Saturday from 7 am to 11 pm. Please note: subject to change, please contact the residence before your arrival. For a weekend, a short break or winter holiday at Aime-La Plagne, the Hauts Bois residence offers rental accommodation ranging from 1-2 bedroom apartments for 3-4 people to 4-bedroom apartments for 8-10 people. Accommodation description : 1 living room, 1 sleeping alcove, 1 bedroom, 1 kitchenette, 1 bathroom and 1 toilet. Living room description : 1 convertible sofa bed (sleeps 2) and 1 sleeping alcove with 2 bunk beds. Description Bedrooms : 1 bedroom with 1 double bed. Description Kitchen : Kitchenette opens out onto the living room. Bathroom description : 1 bath and 1 toilet. Accommodation description : 1 living room, 2 bedrooms, 1 kitchenette, 1 bathroom and 1 toilet. Living room description : 1 convertible sofa bed (sleeps 2). Description Bedrooms : 1 bedroom with 1 double bed, 1 bedroom with 2 single beds. Description Kitchen : Kitchenette opens out onto the living room. Bathroom description : 1 shower or 1 bath and 1 toilet. Description Others : 2 apartments are duplex. Accommodation description : 1 living room, 2 bedrooms, 1 kitchenette, 1 bathroom and 1 toilet. Living room description : 1 convertible sofa bed (sleeps 2) and 1 sleeping alcove with 2 bunk beds. Description Bedrooms : 1 bedroom with 1 double bed and 1 bedroom with 2 single beds. Description Kitchen : Kitchenette opens out onto the living room. Bathroom description : 1 shower with 1 toilet and 1 bath. Accommodation description : 1 living room, 3 bedrooms, 1 kitchenette, 2 bathrooms and 1 toilet. Living room description : 1 convertible sofa bed (sleeps 2). Description Bedrooms : 1 bedroom with 1 double bed and 2 bedrooms with 2 single beds. Description Kitchen : Kitchenette opens out onto the living room. Bathroom description : 1 shower, 1 bath and 2 toilets. Description Others : Some apartments are duplex apartments. Accommodation description : 1 living room, 3 bedrooms, 1 kitchenette, 2 bathrooms and 2 toilets. Living room description : 1 convertible sofa bed (sleeps 2). Description Bedrooms : 1 bedroom with 1 double bed and 2 bedrooms with 2 single beds. Description Kitchen : Kitchenette opens out onto the living room. Bathroom description : 1 shower, 1 bath and 2 toilets. Description Others : Some apartments are duplex apartments. More spacious apartment with Nespresso® coffee machine, professional capsules for sale at reception. Accommodation description : 1 living room, 4 bedrooms, 1 kitchenette, 2 bathrooms and toilet. Living room description : 1 convertible sofa bed (sleeps 2) Description Bedrooms : 1 bedroom with 1 double bed and 3 bedrooms with 2 single beds. Description Kitchen : Kitchenette opens out onto the living room. Bathroom description : 1 shower, 1 bath and 1 toilet. Description Others : More spacious apartment with Nespresso® coffee machine, professional capsules for sale at reception.